Well, another year is down the drain and we already pulled the cork out of the new one a month or so ago. How's that working out for you? I hope the new year finds you well. If you're receiving this letter that means you signed up for "The Seven Bars Of The Soul" an eleven month long correspondence course about the mysterious energy vortexes that are found inside of each of us, along our spine. Crazy, right? Just about every system of mystic and/or magical thought knows about these vortexes, those on The Way Of The Path Of The Booze Wizard are no exception. Most of them use different names for them. 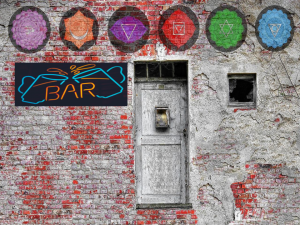 You might be familiar with the term "Chakra" which is the Eastern term, or you might know them as the Seven Churches or Seals from the book of Revelations, or you might know them as some other crazy sounding thing- not the point here. If you aren't familiar with those terms, it's ok- we're going to call them by the Booze Wizard's name and go with "Seven Bars of The Soul", as previously mentioned. Lesson One: This is the one you're reading now! It contains the information in it! Keep Reading. What Are The Seven Bars Of The Soul? As mentioned, The Seven Bars Of The Soul are simply vortexes of mystical and nervous energy which are located along one's spine. They serve not only as actual physical spots on the body, but also as a way to understand our thoughts, feelings, urges, and motivations. It gives the Booze Wizard a simple map for exploring and explaining their consciousness to themselves and possibly, others, should it ever come to that. We'll cover that in lesson two, but if you hunt around this lesson, you'll be sure to find some information about their importance. 1. Keep reading this lesson and maybe take some notes. Well, that's enough for this time. You might want to re-read this lesson a few more times before it's time for the next one. I hope you're ready for it. I'm sure you will be, you're a Booze Wizard, after all. B. F. Smith (photo unavailable), also known as "The Alchemist of the Blues", is a time traveling Bluesman/Alchemist and founder of "Zen Boozism- The Path of the Booze Wizard." When he's not investigating chrono-anomalies or having the blues, he runs a mail order mystery school which mails out mysteries to those enrolled and then schools them.